Spring and summer in the Danish art community mean con-season and Artist Alleys. I have signed up for three cons this season. The first convention is this Friday (April 27th - 29th) and is at J-Popcon. The next Artist Alley is only one week later and is Comic-Con Copenhagen (May 5th - 6th). The third is not until August, but it still means that I have to prep for two Artist Alleys at the same time - and the deadline is closing in. So here's a rough overview of an artist's mind when con-season is closing in. I'm a home printer. I have invested in an Epson SureColor P-400 inkjet printer. It has 8 ink cartridges and prints up to 13 in / 33 cm wide images. I want to be able to control every single one of my prints personally to ensure the best quality. I have tried a lot of different paper over the past year but Matte Cotton and Lustre-paper types have turned out to be my favorites so far. I especially adore Baryta paper. Printing for an artist alley is a little pricey and in the future, I might buy some of my prints online if I suspect certain prints to sell really well. One large print (A4) costs me roughly $2.50 in inks and approx. $1.50 in paper depending on the type of paper I choose for the specific print. I'm selling this kind of print for approx. $10 so I do profit from them but since I'm not guaranteed to sell them I'm not guaranteed to profit from them either. If you'd have to calculate the time I use for proofing the prints, signing them and packaging them as well, then the profit is pretty small in the end. Especially if you include the costs in ink and paper it takes to test print every drawing or if the printer leaves marks by mistake (because it happens). These are just some of the costs (and potential costs) you should have in mind if you're considering to become a home printer like myself. In time I plan to raise my prices, but I'd rather start a little low and go higher than the other way around. Sometimes I adjust the prices a little when I arrive at the con so that I don't stand out too much from the other artists. However there are a lot of things to consider if you start comparing prices such as, but not limited to, paper quality, art quality and how much each print costs the artist to make. Even art styles are okay to include in these situations. How unique are your products? Sometimes, if you order your prints from a printing service you might get them for approx. half the price a piece compared to what it would cost me to print myself. The reason is that you usually buy bigger bulks of your print at a printing service and therefore save some money. This way you can sell them cheaper at the convention and still make a nice profit. For artist alleys, it is a good idea to have special offers - at least I have very good experience with it. So I typically offer one large print (A4) for approx. $10 and 2 for approx. $16.50 (these prices are converted from Danish Kroner). Same goes for my medium and smaller prints and stickers. The smaller they are the "bigger" the offer. E.g. stickers are roughly $2 each but you can get 3 for approx. $4. Basically, it means that a single item gets cheaper the more the customer buys and who doesn't like things getting cheaper? I usually also offer specially priced commissions at conventions if I'm in need of a little extra cash. Thought from my experience I have learned not to take on too many commissions and not underprice myself. I think it is better to not take any commissions because the price was "right" rather than stress myself out the entire weekend, just so I can finish a few cheap commissions. That's my personal opinion at least. I always aim to break even from a convention. Being part of an artist alley is truly fun but not worth financially ruining yourself over. Make sure to at least cover the fees in connection with the con such as the ticket, the table fee and your print costs (from those that you sold). At my first artist alley where I brought prints, I had no clue what or how to price them. I had some idea of what my art was worth, but I also knew that I was using a budget printer at the time and had very little experience with selling my artwork - let alone produce the prints. Before I left for the con I wrote a price list containing two price sets. One price set included my minimum prices. These were the prices that I was not willing to go under. The other price set included my preferred prices. They were higher than my minimum prices but I felt like they better reflected my art's worth. When I arrived at the convention and most of the other artists had set up their tables, I took a look around to see their prices. I especially looked at the paper quality, trying to determine their art experience and art styles. Then I found those that reflected me the best and compared their prices to mine. I wasn't too off and basically went with my preferred prices. Don't underprice/undervalue yourself as an artist. People will see right through it and will more likely move on instead of buying your items. "Art is a luxury" I always tell myself. After last con season, I invested in a set of storage cubes. I saw a lot of other artists use them and got very excited about the possibilities for future setups. This season will be the first time I'm using them and I have a pretty good feeling about it. I already made some initial test setups and they're shown below. For J-Popcon 2018 I will be sharing my table with a friend, and we will have a setup close to what can be seen in the images below. We have this idea of mirrorring the table across the middle but I have so many products that I will probably be all over the table by the end. My prints as well (hah!). I'm sitting on the left and my friend will be sitting on the right as the corners indicate. I'm doing more tests next week once J-Popcon is over. I will also do a proper entry with pictures after the cons and talk about my experiences in the artist alley. I've made new business cards again this year. I want to make a new card every year. If for no other reason, then just to have my newest artwork on the cover. Below you can see my evolution of business cards so far. I attended my first artist alley in 2015 doing only commissions - not bringing anything to sell other than that. I didn't attend any artist alleys in 2016 so my business card was the same for a long time, but when I got back into attending in 2017, I made two new cards with the only difference being the little icon on the back which would fit my current avatar on the internet at the time. This year, for the first time, I'm going with round corners. A lot of the business cards I have collected from others over the years start to show damage in the corners. I thought going with rounded corners might counteract that a bit. I do not spend a fortune on my business cards (yet) so I usually go with some sort of economy printing service (Vistaprint so far). I might try to order from a different place next time to see the difference in quality. I wanted to make a banner or a roll-up this year, but I didn't have "the right artwork" for it yet so maybe next time. 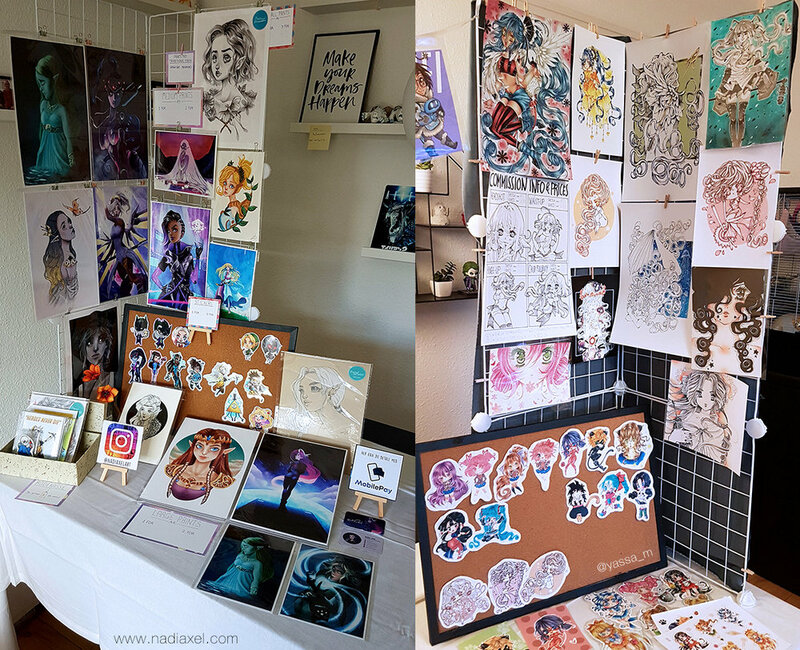 I think it looks very inviting and professional when artists have a banner, a little sign or a roll-up with some of their artwork by their table. I'm also hoping to bring a tablet where you can sign up for my newsletter. Using a tablet to show off your Youtube videos is also a great idea. I like to make a specific artist alley playlist for this purpose and let it play on repeat somewhere where people can see it. In the future, I plan to have a mini-portfolio to hand out along with my business cards. Especially to potential clients. This year for J-Popcon I made a small collab with my friend whom I will share the table with. We're both posting the collab on our Instagram accounts. I like to show my followers the table plan of the artist alley as well to let people know where they can find me. Below are the images for our Instagram accounts. I still have to figure out what to do for Comic-con. There is a lot more I could talk about, but this post is meant to be more of an insight into my head right now rather than a complete guide. I hope you can draw some inspiration from my thoughts. The first convention is Friday this week. Then there is less than a week until the next one. I still have some designs for both prints and stickers that I need to finish, so I better stop writing this post and get back to work, hah. If there is anything you'd like me to include in the post-artist alley blog post let me know in the comments below. This is where you will find my blog, where I write about a lot of art related subjects. Sometimes I use the blog to promote news from my shop, patreon or youtube. Sometimes it’s just about life as a freelance artist.